Positioned between the Caribbean Sea and Riviera Maya's jungle, Hotel Xcaret Mexico is a unique destination that showcases its love of history and nature. In addition to curated cuisine and day and evening activities, you will enjoy full access to Xcaret Nature parks and tours as part of the complete ALL-FUN INCLUSIVE experience. Dining plans and shuttle service between the resort and parks also included. 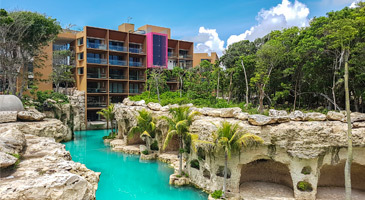 Parks include Xcaret, Xel-Ha, Xoximilco, Xenses, Xplor, and Xplor Fuego. Tours include Xenotes Oasis Maya, Xichen Deluxe, Xel-Ha-Tulum, and Xel-Ha-Coba Tour.